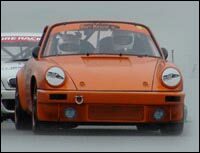 ORANGE was built to provide a bullet-proof track car suitable for all Brey-Krause drivers. The car is designed to teach drivers to drive; a simple car with no electronics, no ABS, no Traction Control, and street tires. This concept forces the driver to learn the basics of driving on the track; there's no technology to cover up driver mistakes. The end result is a car that is not easy to drive and the driver works hard to acquire the skills to drive it properly. This car started life as a 1977 Porsche 911 blank tub. Peter Dawe at Dawe’s Motorsports prepped the car. The tub was acid dipped and the cage put in. 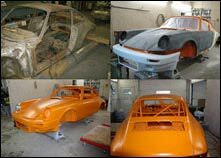 The tub was then powder-coated orange, the body work assembled, and the gas tank and other body parts put in the car. The car was then sent to a specialty shop where the engine was built and final touches made. 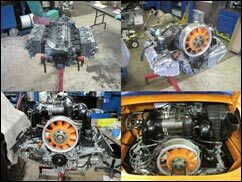 This engine was completely rebuilt from the ground up using a modified 3.2 L with a 915 transmission. Finally the interior was assembled resulting in not only a bullet-proof track car, but also a piece of artwork. ORANGE is a truly unique classic 911 that challenges and entertains drivers of all experience levels. View our photo gallery for more photos of this build.